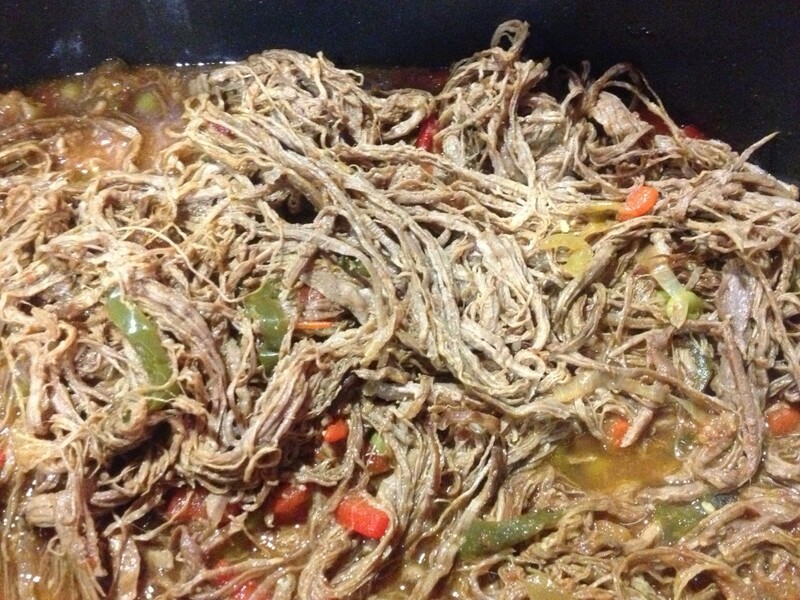 Ropa Vieja is a latin dish that translates to “Old Clothes.” The dish gets its name because of the way the meat shreds into tender delicious pieces after slow cooking all day. It couldn’t be more simple to make and can be used in a variety of dishes! QUICK TIP: If you have the money to spend, then purchase the All-Clad non-stick crock pot. It’s great because you can actually use it to brown the meat, making most things a one-pot clean up. The non-stick coating also means a fairly effortless clean up afterwards. My wife and I got ours at Williams-Sonoma. 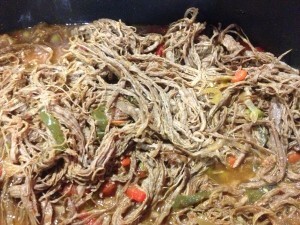 A great slow cooker dish that can be used in a variety of ways. Step 1 In a large sauté pan, add coconut oil and allow to heat. Step 2 Add bell peppers, onions and cook until veggies become tender. Step 3 Add veggies to a slow-cooker set to medium, along with steak, tomato sauce, garlic, salt, safron seasoning, bay leaf, optional dry sherry and pimentos. Step 4 After about 8 hours in the slow cooker, steak will pull apart and dish is ready to serve.